Matt Yglesias thinks that my Washington Monthly piece is talking about the crisis that “we should have had,” not the crisis we actually had. I think sections of Tyler Cowen’s The Great Stagnation are about the crisis we should have had, that Michael Spence’s The Next Convergence is largely about the crisis we should have had, Joe Stiglitz’ recent Vanity Fair article is basically about the crisis we should have had, Michael Mandel’s piece on the myth of American productivity is about the crisis we should have had. I can name others. There’s no particular ideological tendency grouping these people together, since if we were facing a big profound crisis then it would be the case that we need big profound answers that can support a range of different ideological positions. Indeed, I would say that an awful lot of the Obama agenda has been about efforts to address the crisis we should have had. That’s why long-term fiscal austerity is important and why there was no “holy crap the economy’s falling apart, let’s forget about comprehensive reform of the health, energy, and education sectors” moment back in 2009. But this is not the crisis we’re having. Interest rates are low. Headlines tell us that “U.S. Factories Could Suffer From Dollar’s Appeal”. I’m inclined to think that we will, at some future point, face the crisis we should have had and it will need to be addressed in complicated ways. But the crisis we’re having is, for all its horror and scale, a pretty banal monetary crunch—the natural rate of interest is below zero, nomimal rates can’t go below zero, and the Fed won’t act to push real rates lower. I don’t understand Matt’s argument. He cites low interest rates as evidence for his side. However, we would expect a slow growth, low-innovation crisis to push interest rates lower, since there would be fewer good opportunities for investment. The other issue is that the economy is not behaving the way we would expect a high-productivity, high-innovation economy to behave. One example: real wages for new college grads have been falling for a decade, even before the recession. That shouldn’t happen if there were growing innovative industries for them to find jobs in. 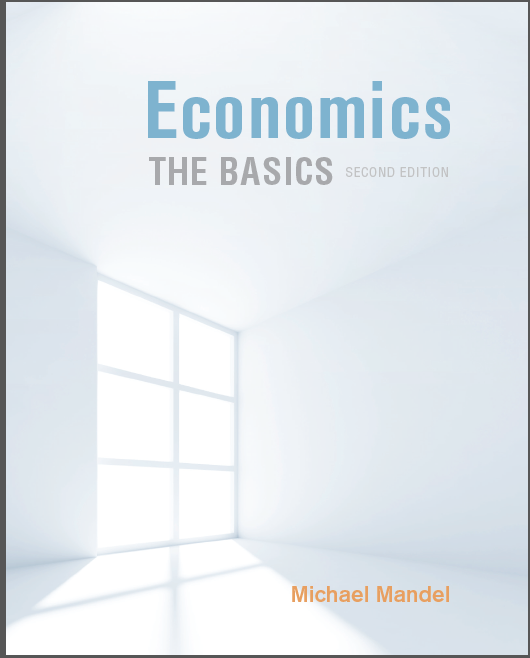 I just received printed copies of the second edition of my textbook Economics:The Basics–yeah! It’s designed for a one-semester “basics of economics” course–not much math needed, but covering all the economic principles the typical person might need. I’ve started a new twitter feed at @MandeltheBasics specifically to accompany the textbook. If you teach economics and want to see the table of contents, look here.